Click on the picture for larger view and for download. Climate change (CC) affects fresh water resources and may have significant influence on public drinking water supply. Water suppliers have to identify and evaluate CC impacts on availability and safety of public drinking water supply and propose adaptation measures, considering their socio-economic consequences. The main water supply problems are related to the significant change of surface and groundwater quantity and quality observed in the last decades as an effect of land use practices and very likely of CC. Current water management practices are likely to be inadequate to reduce impacts of CC on water supply reliability. Therefore there is a need for water supply management adaptation measures, which are managing the risks associated with future climate change impacts. Applying well prepared adaptation measures would serve to solve conflicts between competing sectors and demands. 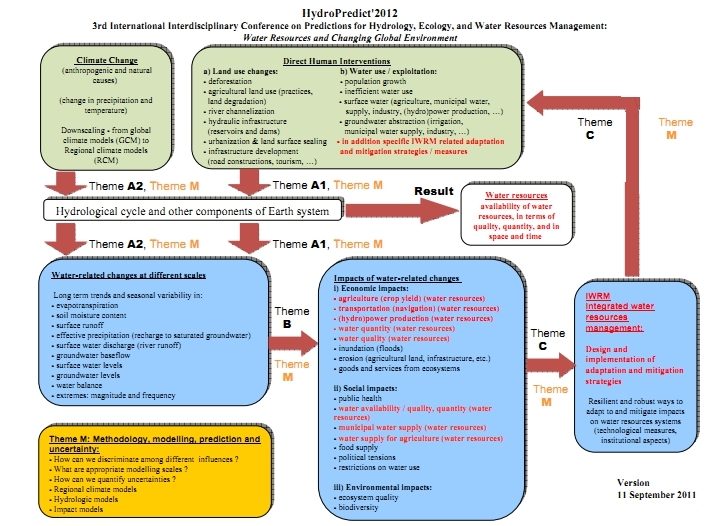 In this section contributions regarding impact of CC on water quantity and quality and the relation between land use and recharge; socio-economic and institutional aspects of vulnerability and adaptation of water supply, including costs and benefits; risk assessment to secure drinking water supply under changing climate; water supply management for adaptation to land use and CC changes. When you submit an abstract through the Abstract Submission web page, in its subpage 'Select Topic ID Numbers' you can indicate there (check box) that you intend to contribute to this Special Session. Structural errors of models, parameter uncertainties, data errors – there are many reasons why model-based predictions are uncertain. The value of a prediction is limited, if the corresponding uncertainties are not understood, quantified and reduced. Ensemble predictions with a single model can be used to demonstrate the sensitivity of simulation results in relationship to the uncertainties of input, state variables or model parameters. More and more also multi-model ensemble predictions are applied to demonstrate the impacts of model uncertainties. It is relatively easy to generate ensemble predictions: Samples from the assumed pdf´s of uncertain input data, initial state variables and/or model parameters are taken and applied to run the model forward many times with the aim to describe the uncertainties in model outputs from a large sample of predictions with statistical measures. Ensemble predictions are more and more used to characterise uncertainties in climate change impact studies (using multi-model ensembles of different GCMs and regional model, used for downscaling of their outcome), flood forecasting systems with different weather scenarios, or in model chains where the ensembles of the output of one model provides the input in other models (e.g. combining socio-economic models with water management models). The limitations of this approach are: the pdf’s of uncertain characteristics and variables are not known; they may vary in time and depend on the initial state. In many cases ensemble prediction systems does not completely represent the uncertainties of models. Neither the total variation (which would result from a large amount of possible combinations of uncertain aspects of modelling) nor a differentiation in more or less probable forecasts can be represented in this way. However a probabilistic evaluation of the outcome would be useful in many applications. Thus it is challenging to develop ensemble generation mechanisms which do not only result in a bunch of model outcomes, but also represent the probabilistic assessment of the variables under consideration. Nowadays the practical application of ensemble predictions cannot be based on the classical statistical approach of expected values and intervals of confidence. In this session, the ways how to specify ensembles should be discussed together with the options to apply them in practical decision problems. Ensemble predictions for different time scales (from flood events up to climate change impact assessments) can be presented. The spatial scale should be river basins. Any contribution about ensemble generation should be combined with recommendations how these ensemble could be used for decision making in practice. Contributions about new and improved Bayesian methods to handle ensembles are especially welcomed. That earth’s climate has changed in the past and is continuously changing over long periods of time has always been accepted. The realization that these changes have been accelerated due to human actions has been increasing in recent years. However, climate projections and the translation of these projected changes in temperature and precipitation into changes in runoff and streamflow are accompanied by serious uncertainties and skepticism. There is currently no consensus on how to approach planning and hydrologic design of water resources projects under climate change uncertainty. It is necessary to inform the process of tool selection with a clear understanding of the problem statements that they could help to solve and see how different tools can be used, instead of the other way around. Too much emphasis has been placed on climate data, modelling and methodologies for generating climate data projections instead of in analyzing the problem itself, how to solve it and how to translate the climate uncertainties into risk, vis a vis other intervening factors. The Water Unit of the World Bank and the Water Partnership Program (WPP) in collaboration with other organizations is working towards creating a basis to inform the selection of a set of practical working tools useful for adaptation to climate change of water-related projects at different stages. These tools are also envisioned taking into account the information and institutional deficiencies of many developing countries and will also encompass not only the hydrological aspects but also the engineering, economic, and financial considerations. Contributions are welcome on how can we identify, separate and quantify water-related changes due to direct human interventions from those due to climate change; how can we quantify/prognose/predict the effect/consequences of water-related changes in terms of economic, social and environmental impacts; what are the appropriate adaptation and mitigation strategies to reduce vulnerability and to increase the resilience of water resources systems; and what are the reliable tools available for developing countries under conditions of limited technical and institutional capacities and with huge data deficiencies. When you submit an abstract through the Abstract Submission web page, in its subpage 'Select Topic ID Numbers' you can indicate there by checking the box T34 that you intend to contribute to this Special Session S3 and write on top of the abstract core text “For Special Session S3 – Choosing models for resilient water resources management”. Please make sure that the abstract focuses on/ deals with, predominantly, scientific/ technological/ engineering aspects.